Nikki, a black/tan Lancashire Heeler age 7 months. Photo Courtesy of Hotpot Lancashire Heelers. The Lancashire Heeler is very alert and friendly with those he knows but may be wary of strangers. An excellent ratter with rabbit catching potential, it has superior strength and broad instinctive abilities. This breed makes a pleasant companion, and does best with older, considerate children. The Lancashire may nip at people’s heels as it has a strong instinct to herd and must be taught not to do it to people. This breed may be difficult to obedience train, but it is trainable. While it has great herding instincts and will make a wonderful herder of cattle, goats and horses, it is rarely used as such. Make sure you are this dog's firm, confident, consistent pack leader to avoid Small Dog Syndrome, human induced behavior problems. Always remember, dogs are canines, not humans. Be sure to meet their natural instincts as animals. The Lancashire Heeler has a lot of energy and it must be kept busy. It needs to be taken on a daily, brisk, long walk. While out on the walk the dog must be made to heel beside or behind the person holding the lead, as in a dog's mind the leader leads the way, and that leader needs to be the human. When people no longer greatly relied on cattle dogs, the Lancashire Heeler declined in numbers greatly to the point of practical extinction. Today's Lancashire Heelers are a re-creation of the original Lancashire Heelers. 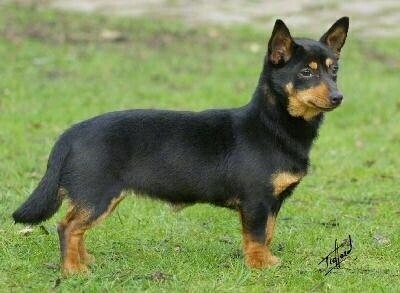 The re-creation has lines of the Welsh Corgi and the Manchester Terrier. 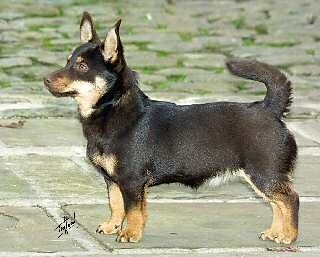 Today's Lancashire Heelers are almost identical to the Lancashire that existed a long time ago. Although the new Lancashires retain the excellent ability to herd, they are now rarely used for cattle herding.